In the early morning hours of November 5, 1871, a stage coach carrying seven people en route to San Bernardino was ambushed just six miles west of Wickenburg, Arizona Territory. Of the eight people in the stage coach, only two people would survive. What followed was an investigation consisting of circumstantial and conflicting was done leading to another massacre but what's the real story? 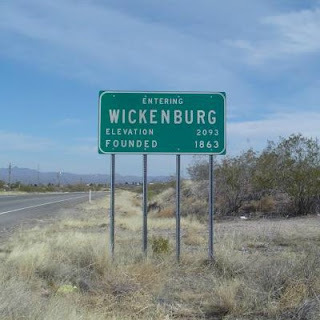 Wickenburg city limit sign. Courtesy kazb.org. One of the travelers on the coach was up-and-coming Boston author Frederick Wadsworth Loring--in fact, the massacre, during the investigation, was called the Loring Massacre. Loring was sent out west to do some reporting and was fresh off the publication of his first novel Two College Friends. After his death, Loring was considered by many to have possibly become a great American novelist. 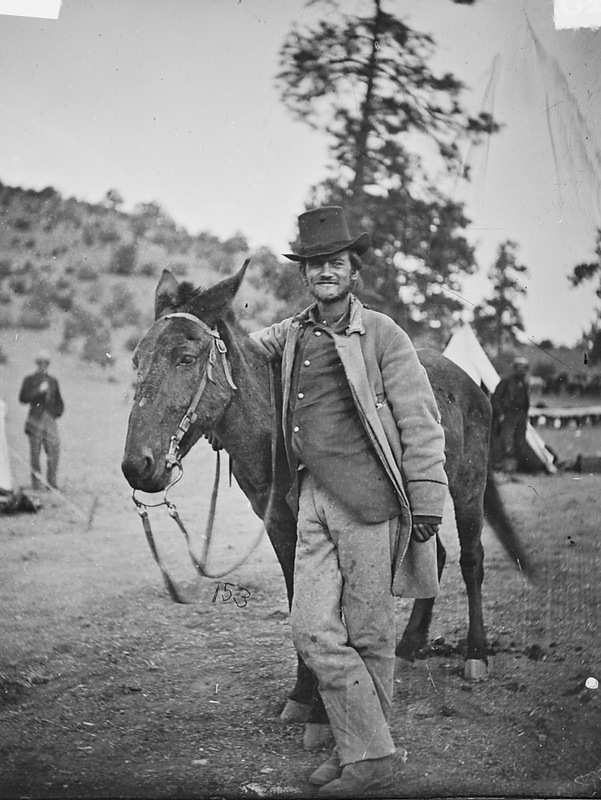 Frederick Loring and his mule, Evil Merodach, 48 hours before his death. Courtesy jbowers.org. A party of mounted men--either Apaches or Mexicans dressed as Apaches--ambushed the coach and began shooting. All but two were killed and those were wounded. The survivors--William Kruger and Mollie Sheppard--were able to run and get away. The next day, a group of men went out to the massacre site with Kruger who detailed what had happened. The contents of mailbags were strewn around, the passengers belongings were disturbed but remained intact. Peter Hamal was the only person that had been scalped indicating that he had tried putting up a fight. That nothing was taken, indicated the attack was perpetrated by ignorant Natives but since the ammunition and animals weren't taken either, it pointed to Mexican bandits. Kruger admitted that it was a crowded coach but that everyone was in good spirits and got along well. Kruger was positive that the attackers were Natives and since he was one of the only survivors, his word was accepted. W.G. Salmon was buried immediately as he was badly mutilated. The other bodies were either interred at the massacre site or taken to one of two cemeteries in Wickenburg at the time--Stone Park or Lumber Yard. The graves of the massacre victims are interred at the massacre site marked with crosses and stones. 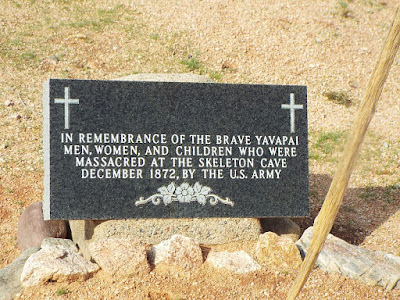 The massacre led to the slaughter of several Yavapai Indians and their forced removal to a reservation with enemies of their tribe where several more were killed. Battles between the U.S. government and Yavapai began in early 1871 and came to an end in 1875 when the Yavapai accepted treaty conditions and were moved to the San Carlos Apache Indian Reservation. Yavapai memorial of the Skeleton Cave Massacre. Courtesy Wikipedia. Mollie Sheppard was an Irish immigrant born in 1847. She had just sold her brothel and was loaded with around $9,000 and William Kruger. In all, there was between $25,000 and $40,000 aboard the stage coach. The money was never recovered. During the attack, both Kruger and Sheppard were injured by the attackers and Kruger said that Sheppard died of her injuries sometime after January 11, 1872 which was the last time they were seen together. Several decades after the massacre, the local Saddle Club went out to the massacre site and noted the six graves from the original victims and one more, smaller, like for a woman. It is suggested that Kruger hired the attackers so that he and Sheppard could run off with the money. They took the money and buried it with plans to go back out and retrieve it when everything died down. Whether or not they found the money is unknown but it's possible that if Sheppard didn't really die of her injuries sustained at Wickenburg, she was possibly murdered by Kruger and buried with the victims. Others consider him a hero, foregoing his life-savings in order to protect Sheppard. There is not enough evidence to make any solid conclusions as to what actually happened and is just one of the many stories of the Wild West. 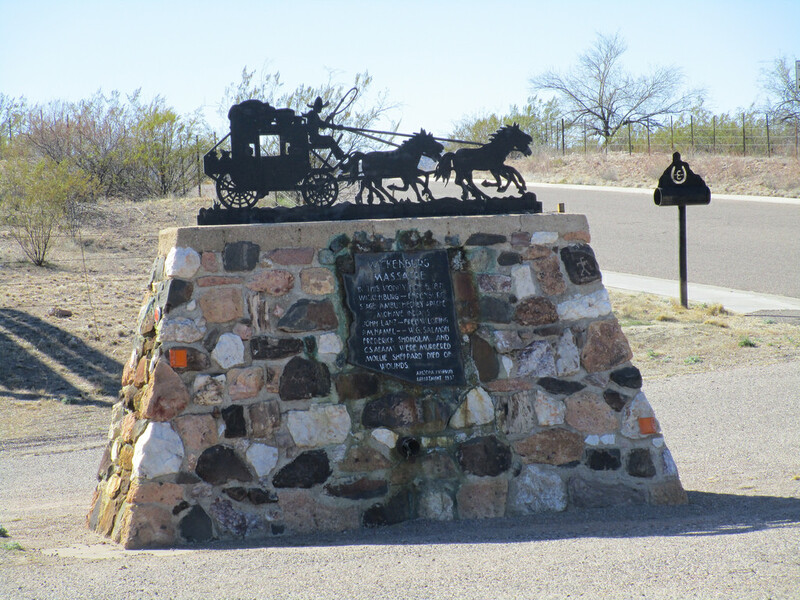 Wickenburg Massacre Memorial, erected by the Arizona Highway Department in 1937. Courtesy Classic Film on Flickr.